Model of Crepe Chinois by Georgette Gabey, 1913. Home » Model of Crepe Chinois by Georgette Gabey, 1913. Model of Crepe Chinois by couturier Georgette Gabey. Cafe au Lait Crepe Chinois. Gracefully draped skirt with tassel to match heavily embroidered waist on chiffon with white embroidered undersleeves and collar. Ornament at waist, and back of brown, blue and silver embroidery. 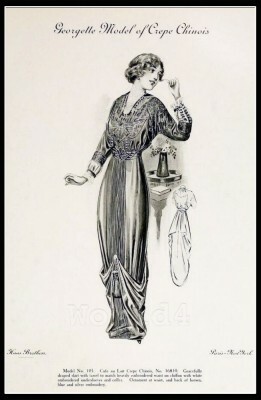 Gallery: France Fin de siècle fashion. Haute couture costumes, spring season 1913. This entry was posted in 10s, 20th Century, Fin de siècle, France, Haute couture and tagged Belle Epoque Fashion, Georgette Gabey, Haute Couture Costumes on 4/18/13 by world4.